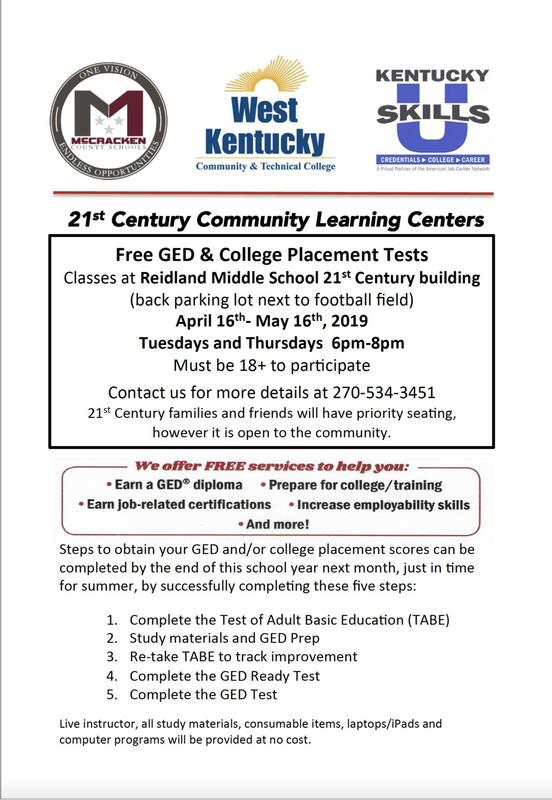 MCPS 21st Century Community Learning Centers is proud to present in conjunction with West Kentucky Community & Technical College free GED and college credentialing (placement tests) beginning Tuesday, April 16th from 6pm to 8 pm at Reidland Middle School’s 21st Century building, in the back parking lot next to the football field. The five week course runs every Tuesday and Thursday April 16th though May 16th from 6 pm-8 pm. You must be 18+ to participate. The cost is free to all students for a GED or college credentialing placement instruction, testing materials, all consumable items and laptops/iPads as necessary. If you have any additional questions please contact WKCTC Skills U at 270-534-3451. Our 21st Century families and friends will have priority seating, however it is open to the public.